Mill-Max is proud to announce a new addition to its spring-loaded pin selection with the introduction of the 0973-0-15-20-77-14-11-0. This new offering has a solder cup designed to accept up to 20 AWG wire, has a maximum stroke of .080" (2,03 mm) and can be used at a minimum spacing of .100" (2,54 mm). 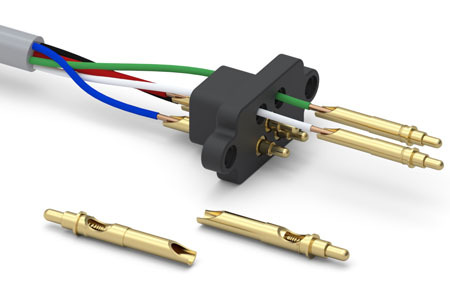 The shoulder and barb features are located and designed to allow easy and reliable assembly into connector housings. The terminating wires may be passed through a connector housing and soldered to the cup of the 0973. Once the soldering is complete the wires can now draw the 0973 spring pins into the housing and the spring pins can be secured with the press-fit. With the pins securely pressed into the housing, the shoulder acts as a stop, retaining the pins in the event the cable or wires are strained. The shoulder will also prevent push out of the spring pin if the plunger end is over compressed. These design features make the 0973 ideal for cable and bulkhead style connector assemblies. The 0973 spring pin has a working travel of .040" (1,02 mm) and a maximum mechanical travel of .080" (2,03 mm). There is a hard stop incorporated to prevent over compression and minimize the risk of damage to the spring. The high retention force press-fit of the solder cup to the body of the spring pin insures the reliability of the component during soldering and assembly operations. Gold-plated brass components and beryllium copper springs ensure the highest conductivity, corrosion resistance and durability. The spring-loaded plunger is suitable for mating with gold- plated PCB pads or Mill-Max target pins and connectors. For wire termination target pins consider Mill-Max 3024-0-01-15-00-00-03-0 and for connectors, see the single row 330-10-1XX-00-240000 and double row 430-10-2XX-00-240000.